This vintage fountain pen is a 1925 Hutcheon in a #4 size – it is a lever-filler in Red Mottled Hard Rubber. Hutcheon was founded around 1915 in Brooklyn, NY to manufacture mechanical pencils and fountain pens. One brother, Alfred, had worked for Mabie Todd (NYC) for almost 20 years, so it is no surprise that Hutcheon pens and mechanical pencils are Mabie Todd look-a-likes. This example has a wonderful barrel imprint, “Property of NY Telephone Company.” Gold filled trim and a fine, semi-flexible nib. Item #157 in Catalog #84. 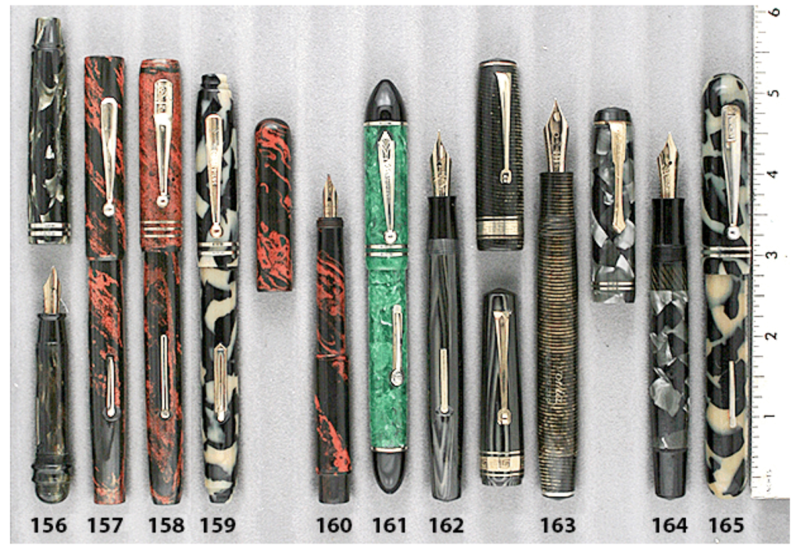 This entry was posted in Vintage Pen, Vintage Pens and tagged Catalog, Catalogs, Extraordinary Pens, Fountain Pens, Go Pens, GoPens, Hutcheon, Vintage Fountain Pen, Vintage Fountain Pens, Vintage Pen, Vintage Pens. Bookmark the permalink. Follow any comments here with the RSS feed for this post. Post a comment or leave a trackback: Trackback URL.